This Eid I received this absolutely stunning necklace as one of my presents. It’s the statement of statement necklaces and I couldn’t wait to wear it. It has an inner nacklace attacked to a huge blue jewel and two smaller blue gems to balance it out. There’s something regal about it but it’s still pretty edgy. I wish I could tell you where it’s from but I honestly have no idea, I do know that it’s from a boutique in East London though so it just goes to show how you can find some amazing stuff in independant shops. I’m going to be honest with you though, I didn’t realise how hard OOTD photo taking was. Well I kind of know but today in particular was really really difficult. Plus it was raining and I was practising taking photos indoors in a very tiny terraced house that is my home. You can probably tell by the photos that I struggled but you know what, I’m going to post them anyway because regardless of how I look the necklace makes the bigger statement. I wore the necklace with a floor length maxi shirt (H&M) and that is literally it. It needs nothing else. 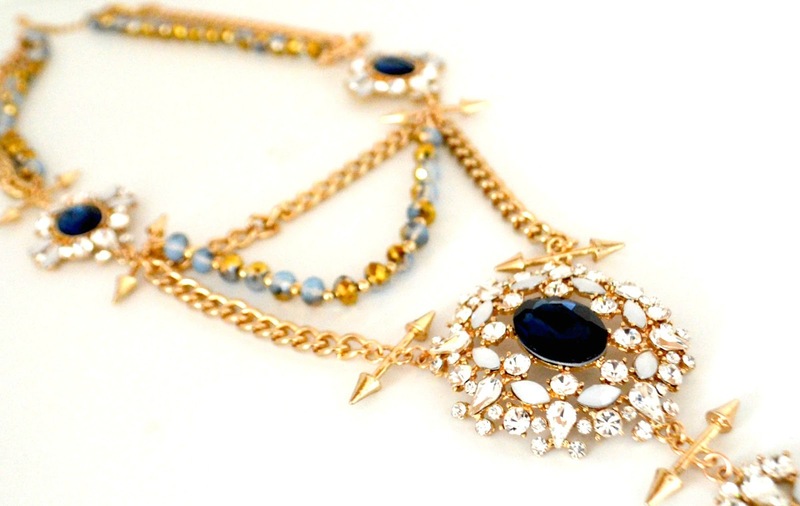 What are your thoughts on statement necklaces?